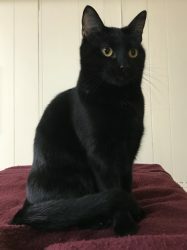 Midnight is a one-year-old DSH female. She is spayed, micro chipped, appropriately vaccinated, treated for parasites, tested negative for feline leukemia and FIV. Midnight came to us a very young momma nursing a litter of newborn kittens. Her kittens have all been adopted while Midnight still waits. She is still very much a kitten herself, playful and affectionate. For more information please call 706-436-0965 or email [email protected].